Umesh Yadav misses out from this game due to a niggle. Vidarbha converted their appearance in a Ranji Trophy final into a title for the second time in a row and now have a chance to try their luck in the Z R Irani Cup which starts on Tuesday. They will be up against the Rest of India team filled with Test cricket prospects and performers from the Ranji Trophy. So far, only two team have registered the double of winning the Ranji Trophy and Irani Trophy in back to back season. Bombay repeated this feat on multiple occasions until the 1990s while Karnataka won Ranji and Irani in 2013/14 and 2014/15. In the previous 13 editions of this tournament, the Rest of India side won ten times. Ajinkya Rahane will be leading the Rest of India who is one of the three active Test players. Mayank Agarwal and Hanuma Vihari are the others while Wasim Jaffer is the only Test player in Vidarbha. 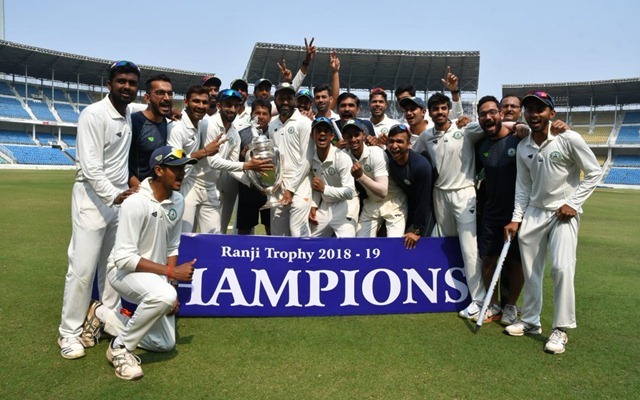 The Z R Irani Cup 2018-19 will be played between the Ranji Trophy champions Vidarbha and the Rest of India team at the Vidarbha Cricket Association Stadium, Nagpur. The match will begin on 12th February 2019 at 9:30 AM local time (IST) (4:00 AM GMT). It will be live on Star Sports 2 and Star Sports 2 HD. Streaming available on Hotstar. The Nagpur Stadium has historically produced help for the pacers on the first day and the turn for the spinners as the game progresses. The 2nd and 3rd days will be best for the batsmen. The Ranji Trophy final, however, hardly kept pacers involved in the game. Sanjay Ramaswamy, Faiz Fazal (C), Wasim Jaffer, Ganesh Satish, Mohit Kale, Akshay Wadkar (WK), Akshay Wakhare, Aditya Sarwate, Akshay Karnewar, Yash Thakur, Rajneesh Gurbani. Bench – Apoorv Wankhade, Aditya Thakare, Atharwa Taide. Mayank Agarwal, Anmolpreet Singh, Hanuma Vihari, Shreyas Iyer, Ajinkya Rahane (C), Ishan Kishan (WK), Krishnappa Gowtham, Dharmendrasinh Jadeja, Rahul Chahar, Ankit Rajpoot, Ronit More. Bench: Tanveer Ul-Haq, Sandeep Warrier, Rinku Singh, Snell Patel. One of Jadeja and Chahar could be replaced by Warrier or Tanveer depending on the pitch conditions. Umesh Yadav misses out this game due to niggle while Akshay Karnewar will be taking the field only two days after his marriage having tied knot on 10th February. Ishan Kishan has had a couple of good tournaments recently playing for the National Select teams. However, the young keeper-batsman has a woeful record when it comes to playing for India A or Duleep Trophy. He aggregated only 108 runs in the ten innings he batted in those games including five ducks. However, in Ranji Trophy, Kishan has 2428 runs with five centuries and 14 fifties from 32 games at an average of 44.96. The 20-year-old have had some good knocks during the Unofficial ODI series and in the warm-up matches against England Lions. Kishan is known for producing some brilliant knocks on tough surfaces and the pitch in Nagpur could be one of those kinds. He costs only 8.5 credits and will be a useful pick from the keepers’ category. 24.52 – Ajinkya Rahane’s batting average in first-class in India since the start of the home Test series against England in 2016. Rahane scored 613 runs from 16 matches with only three fifties and four ducks. Given his recent record in Indian conditions, it will be better to ignore the ROI captain given his high price tag of 10 credits. 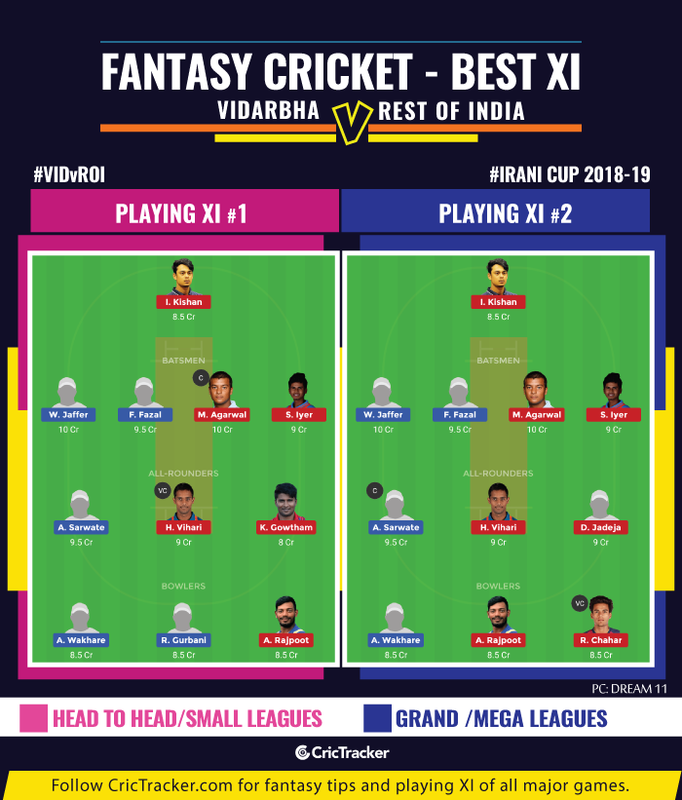 The defending champions Vidarbha will start as the favourites against Rest of India who are little short on experience.